I have been making this recipe for Raspberry Swirl White Chocolate Cheesecake for a few years now. I found this recipe in one of my many Taste of Home Annual recipe books and been making it ever since and often! 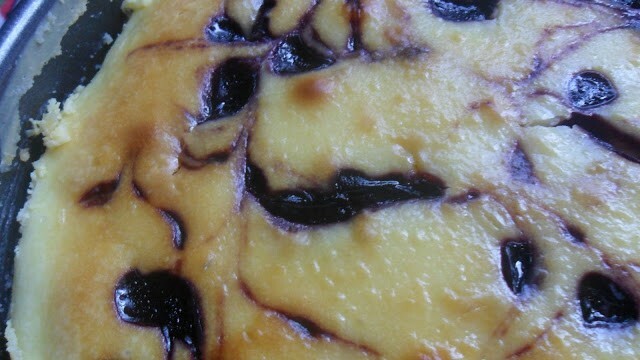 In fact, this is one of the few cheesecake recipes that I make over and over again. With good reason, it turns out every single time and it’s delicious. This recipe calls for using 1/4 cup of your favorite jam or preserves. I used black raspberry today but I’ve used red raspberry, blueberry preserves and even lemon curd. Though a cheesecake can be savory and served with crackers as an appetizer, most of us think of the term as describing a luscious, rich dessert. The texture of cheesecake can vary greatly, from light and airy to dense and rich to smooth and creamy. All cheesecakes begin with cheese. Usually cream cheese, ricotta cheese, cottage cheese or sometimes Swiss or cheddar cheese. 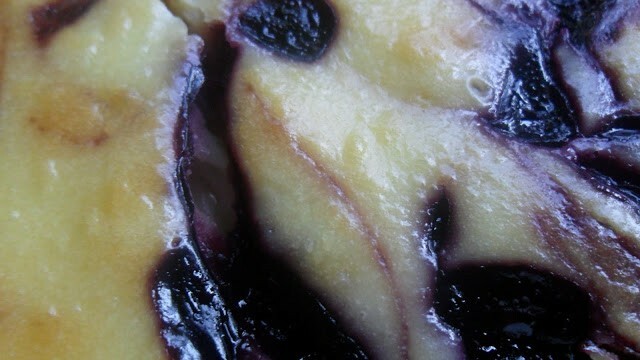 Cheesecakes may or may not have a crust, which can be a light dusting of breadcrumbs, a cookie crust or a pasty crust. The filling is made by creaming the cheese and mixing it with eggs, sugar and other flavorings. The mixture is then poured into a special springform pan and baked. After baking, the cheesecake is thoroughly chilled and generously topped with sour cream, whipped cream, fruit, chocolate or nuts. Springform pans have a latch on the side of the pan and a removable bottom that makes it easy to ‘release’ the cheesecake from the pan, which makes serving cheesecake easier. Springform pans are also deep and rather wide, allowing for enough room for all of the tasty cheese filling. White chocolate chips are combined with cream cheese to make an incredible tasting cheesecake. 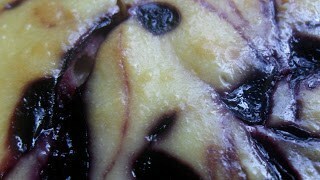 Topped with black raspberry jam that is swirled into the filling before baking adds that special touch. Place springform pan on a double thickness of heavy-duty foil. Securely wrap foil around pan. In small bowl, combine the graham cracker crumbs, sugar and butter. Press onto the bottom of a greased 9-in. springform pan, set aside. In a large bowl, beat cream cheese and sugar until smooth. Beat in sour cream, flour and vanilla extract. Add eggs; beat on low speed just until combined. Fold in lemon zest and chips. Pour over crust. 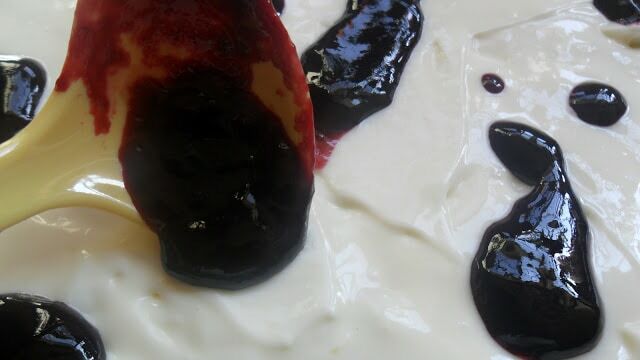 In microwave, melt black raspberry jam or jam of choice, stir until smooth. 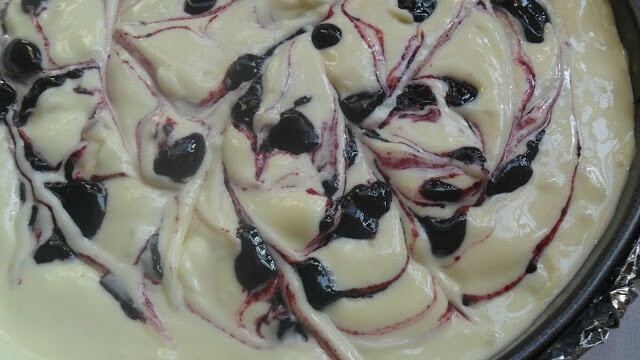 Drop by teaspoonfuls over batter; cut through batter with a knife to swirl. Bake at 325º for 70 to 75 minutes or until center is just set. Remove from oven and remove tin foil from around pan. Cool pan on a wire rack for 10 minutes. Carefully run a knife around edge of pan to loosen; cool 1 hour longer. Cover and refrigerate overnight. Remove sides of pan. Serve with your favorite whipped topping. Lynn – I chose this fabulous recipe to feature as my personal favorite at Weekend Potlluck. Please stop by and snag the Featured Button. Great tutorial. Looking forward to making this soon. Enjoy a great weekend. Looks great! Thanks for posting this to the FESTIVE FRIDAY FIESTA! Hope you'll link back to my party so I can feature some of your great posts! =D Have a great week! Mmmmm! 🙂 This is my kinda dessert! Thank you so much for linking up with me this week at Tasty Tuesdays! I’ve pinned this & shared it with my followers! Oh, my, this looks good. All I had to read was cheesecake and I knew that I would love this recipes. Thank you for sharing on Foodie Friends Friday and I hope you are having a great Mother's Day. What GAWGEOUS photos! I am such a fan of cheesecake….add these awesome add-ins…and I'M IN! =) Or rather, it's IN ME. =) Looks just fabulous. SO glad you shared at Weekend Potluck. This luscious dessert is definitely a winner! Sure would love for you to link back to the party. Thanks. Hope you enjoy an incredible Mother's Day! This looks so creamy and Springtime looking… thanks so much for sharing with us this Mother's Day weekend on foodie friday. What a beautiful dessert. Thank you so much for sharing this awesome recipe with Full Plate Thursday. Hope you have a very special Mothers Day Weekend and come back soon! That looks so pretty! You presented a very good pictorial tutorial, too!